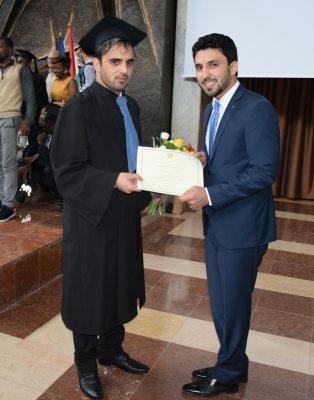 The Embassy of Afghanistan in Vienna, also covering Hungary, was invited to participate in the Graduation Ceremony at Szent Istvan University at the city of Gödöllő in Hungary, held on 14 June 2018, to congratulate Mr. Abdul Walid Salik, a student from Afghanistan, upon his graduation, obtaining his Master of Science degree. The Embassy’s representative, Second Secretary Mr. Omid Kamal, responsible for bilateral issues, expressed his heartfelt congratulations to Mr. Salik and to all other graduates. Szent István University has become the most important educational facility in the area of agriculture in Hungary. For Afghanistan, with a strong agriculture sector, contributing around 20% to its GDP, educated agricultural engineers are essential with a view to modernizing our first sector. Hungary has been a strong partner for Afghanistan for many years, with our development co-operation being launched in 2003. We are very grateful for the essential contributions made by Hungary, which also led the Provincial Reconstruction Team in Baghlan province – at that time one of the largest operations among Hungary’s bilateral international development assistance programmes. Hungary also generously deployed contingents to the ISAF mission and to the Resolute Support Mission and we highly welcome that currently 93 Hungarian troops serve in Afghanistan. Afghanistan also welcomes Hungary’s contributions in multilateral frameworks such as the United Nations and the European Union. And there are great opportunities, too: Central Asia has become an important hub for Hungary’s economic connectivity, and Afghanistan, located at the Heart of Asia and at the Eurasian land bridge, seems like a natural partner for Hungary in trade and investments in and around that region. Afghanistan is interested to expand on our bilateral co-operation and in particular in the area of education, which is a priority policy goal of the Government. We would highly appreciate additional scholarships and fellowships offered by Hungarian universities to Afghan students.